The office will be closed on Monday, April 22, 2019 to observe the Easter holiday. 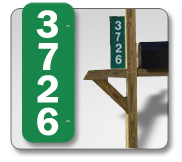 Reflective address signs help emergency vehicles find your house! Signs may be purchased by visiting the township hall or ordered by mail. Please note signs are NOT mailed and must be picked up at the township hall. To purchase a sign by mail, please fill out this form and mail to the township hall with a check made out to Tyrone Township.